Meet Jerry(the veteran) and Buddy(the dog). When Jean at Tulsa Animal Welfare called G.I. Wishes, it was to ask for help. Jean had taken in a new dog, Buddy, and Buddy was in dire shape. He had been abused by his owner, and near death. Thanks to her great care and the wonderful medical care offered at Tulsa Animal Welfare(TAW), Buddy was on the mend. The problem was that Buddy needed more care than they could really offer. Jean’s question to G.I. Wishes was did we have a Veteran who could care for and nurse Buddy back to health, acting as a foster family, until Buddy was healed? Through our affiliation with The Coffee Bunker in Tulsa, and our contact with Mary, there, they arranged for the Veteran, Jerry to consider fostering Buddy. 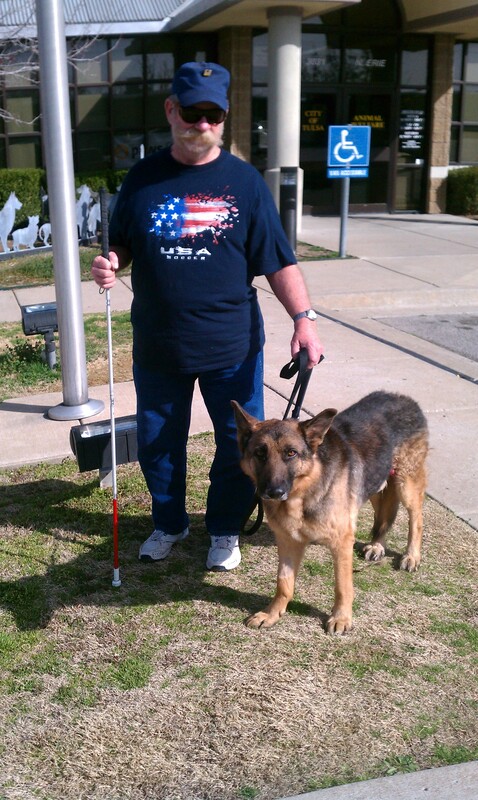 Jerry is a partially-sighted Veteran who is awaiting the arrival of a seeing-eye dog, sometime in May or June of 2012, so the timing of this match-up could not have been better. Through the joint efforts of TAW, The Coffee Bunker, G.I. Wishes, Jean, Jerry, Buddy, Mary, Barbara, and Rob, Jerry and Buddy met for the first time on Thursday afternoon, March 1st, 2012. Buddy and Jerry bonded almost immediately. Buddy goes with Jerry to The Coffee Bunker, and he is the center of attention. Jerry, thank you for all you are doing to heal Buddy, and Buddy, thanks for being Jerry’s friend. Jerry and Buddy are pictured leaving TAW on March 1st for Buddy’s new home. A Pet for a Vet charity Golf Tournament on July 29, 2019, at Meadbow Country Club. We rely entirely on the generosity of our supporters to help keep our doors open to all of the animals and veterans needing our help.